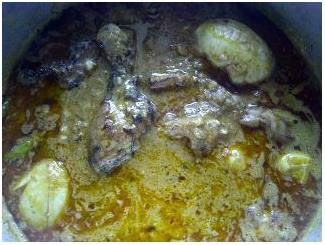 Very delicious Mughlai receipe...... and a must try!!! Deep fry onion pieces in ghee and keep aside. Then fry makhane and keep aside. Add ghee to a cooking vessel and heat. Add milk, ginger garlic paste, tomato paste, coriander powder, chilly powder, garam masala to the ghee. Let it cook for 10 mins on normal flame. Grind the fried onions and kaju with water in a grinder to make a thick paste. Add this kaju paste to the cooking vessel along with chaat masala and salt and cook for another 5-7 mins. Now add 75 g of cream, methi leaves, 1 green chilly, half of cut ginger, lemon juice and stir. Transfer the roasted chicken pieces into the gravy and leave it on low flame for 5-7 mins. Later garnish with rest of chillies, ginger pieces, fried makhane and cut boiled egg. @jean chaurasia, thanx . I will try the suggested method. @ honey pvz. You can roast chicken pcs by using scewers. and no need to add any spice or salt. And even you can try the roasting method as suggested by jean chaurasia. @zishan ali khan , thanx. Recipe can be used for vegetarian dish by replacing chicken with paneer, potato, capcicum etc. Unusual, but a tasty recipe. I dry fried the chicken pcs in a nonstick pot on low heat, the fat from the chicken is enough to fry the chicken till it is light bown. Give this a try before proceeding with the rest of the recipe. Good recipe, but one question, how to roast chicken without any spice and salt? Please reply I want to try this recipe.